About 13-14 years ago I was running a telesales team. I remember another sales manager coming to me to ask if I had any observations on one of his reps. His guy had been with the team for about six months and across the sales floor he had the nickname ‘superman’. Superman. Imagine having that nickname? You’d think he must have been killing it, right? At about 22 years old, he must have been some hotshot that was surging to the top of the leaderboard. Sadly that wasn’t the case here. He was bombing out. Big time. He hadn’t made a sale in over six weeks in a place where one to two sales per week was usual. – He was first in the office and last to leave. Superman. – He had the highest phone times on his team. Superman. – He added the most new leads to his call list each day. Superman. – He made the most dials per hour. Superman. – He followed his script perfectly every time. Superman. – He never left his desk. He was never absent. He upset nobody. He always looked pumped. This was a classic case of fear. The one thing he didn’t do was the one thing he had to do to create business; he had to pitch the ultimate decision maker. But he was too afraid of the rejection so sat right in the comfort zone of pitching minions that couldn’t make a call on buying from him. Why? Because they listened to him. They gave him the word “yes” all day long. It made him feel like he was doing well so he didn’t have to hear rejection. But it was the same as trying to selling a car to a child when it’s the parents that make the call. You just get nowhere. So every time he followed up for the final decision, he got another no. …this is about how he was handling it. To everyone on the outside, this rep was Mr Non-Stop. If anyone deserved wins it was him, right? But he had done what I’ve seen so many people in business do over the years when they don’t generate results. They construct a place to hide from the tough things they really need to do. Those tough things often require less “work” and probably less time, energy and other resources. Ever notice how the top guy often seems to have time to relax, think about their next move and then score again, while the under-performers work their nuts off to get nothing? His hiding place was “looking busy”. Sitting behind vast amounts of busy-ness means that you get left alone: “oh don’t disturb her, she’s always so busy”; “leave that guy alone – he’s on a mission”. But here’s the lesson: you don’t offset poor results by working hard; you offset poor results with productive work. The one thing he needed to do that would make his work effective was being missed. All because it was difficult for him emotionally. So he covered himself by being the nicest, hardest working guy. 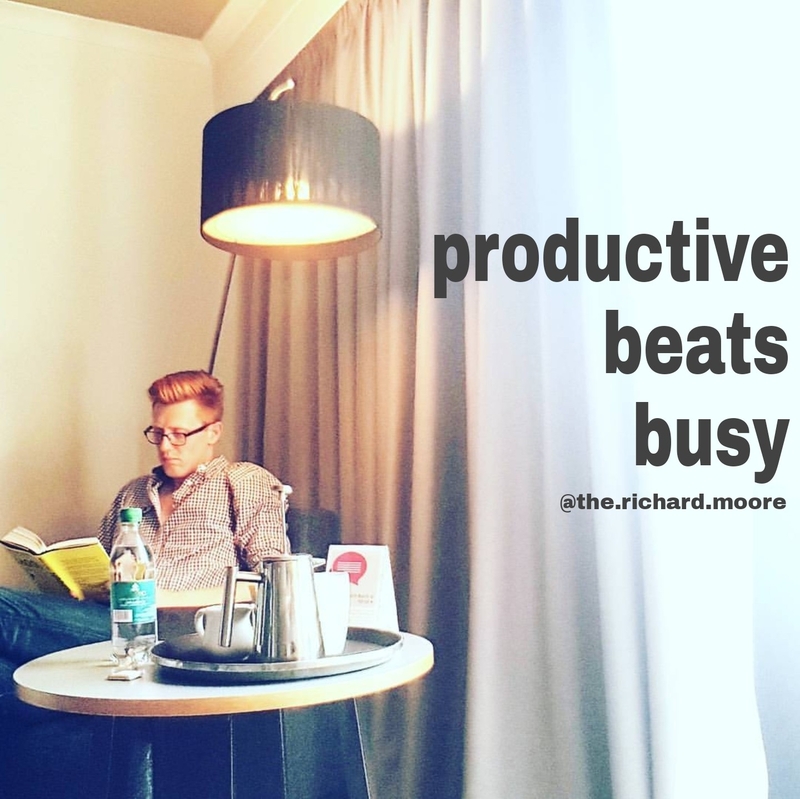 If you choose to take productivity and deliver ‘superman’ levels of it, you’ll become a god. But are you just looking like you’re busy by working hard on things that don’t have an impact? …if you are then you’re actually working to become broke, my friend. And that’s the most tragic use of your time. Richard Moore originally worked 60 hour weeks in the City of London, before deciding to pursue a better life for himself. Now, as owner of four highly successful businesses, Richard is asked to consult with entrepreneurs and business owners that need serious, practical insight to help massively grow their new business ventures. Richard has worked with startups to 9-figure businesses and is regularly retained to coach leadership and sales teams with his courses. Richard is known for reading three times a day, every day. Why does Tyrese Gibson follow this man’s Instagram account?